Big Easy Temptations. Retreat down cobblestone streets, behind historical fa ades and balconies, to discover W New Orleans French Quarter. Mix it up with live jazz, hip bistros, renowned galleries, boutique shops and the iconic Jackson Square all within walking distance. Recline And Revel. Workout at FIT, lounge by the fountain or cool off in WET . Sip a signature cocktail in the outdoor courtyard and indulge in savory New Orleans cuisine at SoBou, our spirited restaurant and bar south of Bourbon Street. Bonne Nuit. Soak in courtyard views from one of our 97 guest rooms, including four carriage houses and one deluxe suite. Recharge in a W Signature Bed amid a redesign channeling jazz and tarot energies, and wake with Bliss Spa lemon + sage sinkside six. In the heart of the French Quarter, Maison de Ville is one of the most romantic destinations in North America. The high Ceiling rooms in the main house are furnished with antiques, four poster beds and period paintings. The historic Audubon Cottages have private courtyards, rare antiques, Audubon prints and are clustered around a pristine swimming pool - the oldest in the French Quarter. Complimentary Continental Breakfast is served daily either in your room or in the courtyard and Port and Sherry are served in the hotel's main parlor. New Orleans is known for unforgettable dining, intoxicating live music, Old World charm and good time living. 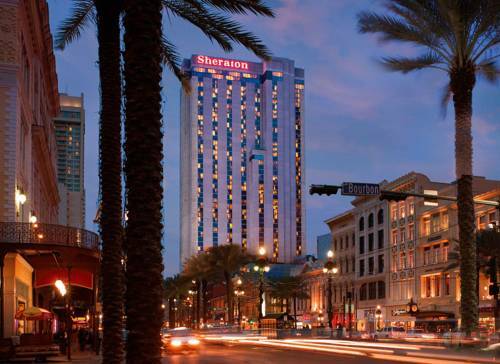 And Sheraton New Orleans Hotel is at the heart of it all. Connect with the sights, sounds and flavors, and let the good times roll. Sample regional cuisine at Roux Bistro or enjoy a cocktail fountain-side at the enchanting Pelican Bar. Work out in our Sheraton Fitness center. Relax at our outdoor pool. Our 1,110 non-smoking guest rooms, including 53 suites, reflect New Orleans charm, and many have views of the Mississippi River or French Quarter. Warm d cor is anchored by the plush Sheraton Sweet Sleeper Bed. The Ritz-Carlton, New Orleans is located on the edge of the French Quarter and steps from downtown and area attractions, making it an ideal destination for both business and leisure travelers. Our hotel allows guests to experience America's most uniquely European city along with the unmatched personal service of The Ritz-Carlton. Ideal for everything from weekend getaways to business conferences, this hotel possesses an allure that is all its own. The four-diamond Omni Royal Orleans is located in the heart of the French Quarter just moments from the excitement of Bourbon Street and picturesque Jackson Square as well as the galleries and antique stores of Royal Street. This luxury hotel offers a retreat from the excitement of the city with its artful collection of 19th century antiques and Creole charm. Our elegant 345 rooms and suites offer plush comfort as well as the latest in technology including high speed wireless internet access that is complimentary for our Omni Select Guest program members. The Omni Royal Orleans also stands out for its restaurant the Rib Room a Zagat award winner and for more than forty years a landmark dining destination in a city known for its fine cuisine. Whether you're here for a cruise or a Courtyard wedding, our New Orleans hotel is in the perfect location for guests to get to know the real French Quarter. New Orleans, Louisiana is a mecca of great food, culture, music and history. 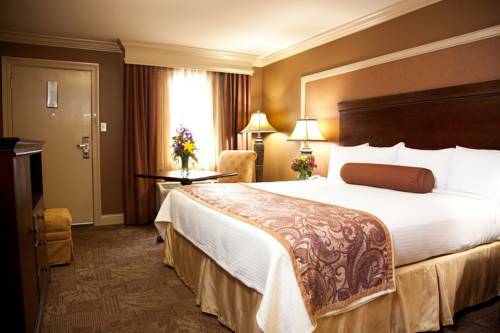 Our French Quarter location is the main reason many guests choose us, but we offer more than an unbeatable location. Our tropical courtyard features an outdoor swimming pool, the perfect place to cool down after a day of adventure or Mardi Gras festivities. A free hot breakfast is our staple, and it includes waffles, fresh fruits and pastries, choice cereals and yogurts, along with 100% Arabica coffee and juices. Our fabulous staff is committed to making your stay at our New Orleans hotel special. 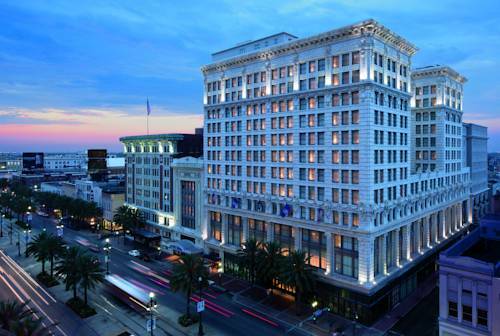 Discover the epitome of old-world charm and modern convenience at the JW Marriott New Orleans. 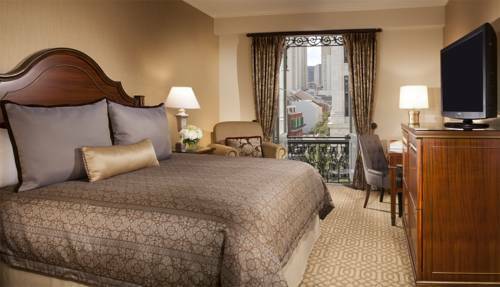 Our luxury French Quarter hotel offers nearly 500 elegantly appointed rooms and suites, accented with lush amenities. If you're looking for the perfect hotel in which to host your New Orleans meeting or event, look no further - our luxury hotel is ideal for grand conferences, or for intimate celebratory events on our stunning terrace with city views. 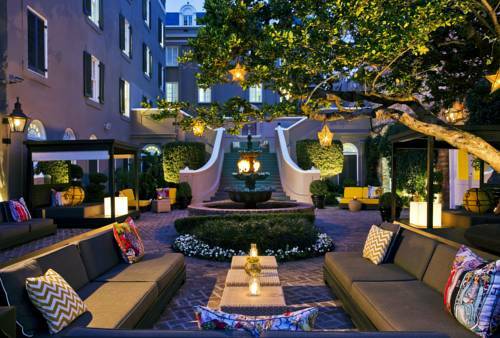 Experience the sophisticated soul of the Big Easy at the JW Marriott New Orleans hotel here in the French Quarter. 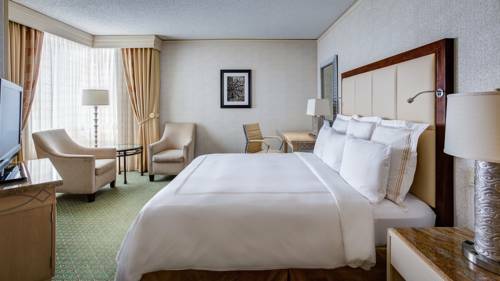 Our contemporary guestrooms offer gorgeous city views, Hyatts signature Grand bed, an iHome stereo with iPod docking station, and our innovative in-room technology. With the click of your remote, get instant access to your favorite shows and movies, room service, hotel information, and more all on your 42 flat-screen TV. 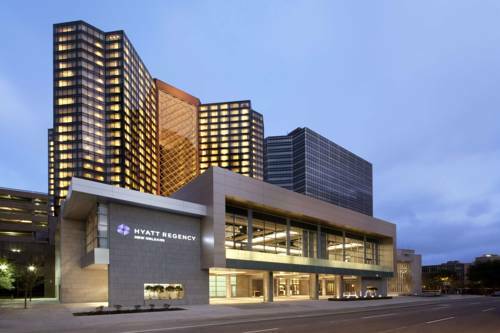 Dining options are endless at Hyatt Regency New Orleans. From our delicious buffet of New Orleans inspired, farm-to-table dishes at 8 Block Kitchen & Bar to our prized barbeque at Whole Hog Caf and fresh sushi creations at Vitascope Hall, were sure to have what you are craving morning noon and night. First as the Grunewald, then as The Roosevelt and now The Fairmont New Orleans, the legendary hotel has created an enduring tradition of hospitality in New Orleans. The tradition began in 1893, when the Grunewald Hotel, a 200-room, six-story hotel named for owner Louis Grunewald, opened on Baronne Street near the fabled French Quarter. Grunewald added a 400-room, 14-story annex in 1908, now the hotel's main entrance. Discover the Big Easy spirit at Loews New Orleans Hotel, where the plush accommodations of a fine luxury hotel are complemented by warm Loews hospitality fabulous food and jazzy cocktails. Laissez Les Bon Temps Roule-Let the Good Times Roll at our New Orleans luxury hotel. 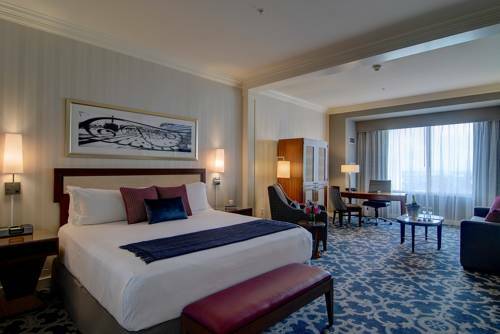 With 285 rooms including 12 suites each of our guestrooms boasts views of the mighty Mississippi River / French Quarter or New Orleans skyline. Settle into New Orleans accommodations that are as luxurious as they are comfortable. All rooms and suites offer breathtaking views of the magnificent Mississippi River, the historic French Quarter or the New Orleans skyline. Nicely sized, thoughtfully appointed and full of Southern charm and modern convenience our New Orleans hotel rooms perfectly blend comfort and style. 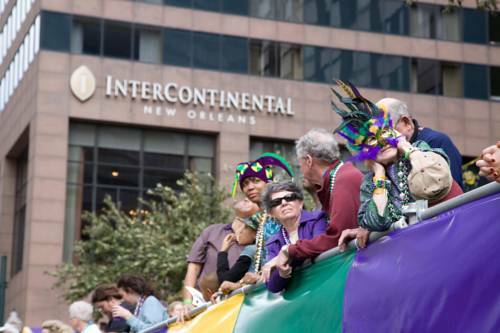 Situated just two blocks from the historic French Quarter, six blocks from the river and front row for Mardis Gras, this luxury hotel in New Orleans is coveted for its location and Four-Diamond status. In the heart of the business district, the hotel is convenient for executives and leisure breaks. From fine, alfresco dining to stunning views from the 15th floor outdoor pool, this contemporary gem is perfectly appointed to explore the best New Orleans has to offer.